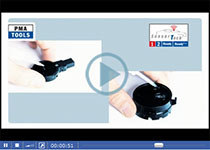 SensorTack® Videos: So fast, so simple! Improve your efficiencies by only using original SensorTack® products for the repair of rain/light sensors and camera systems. The following videos show how easy it is to work with SensorTack®.